Hola, beauties! Samra here. Hope the summers are treating you (and your skin) well. 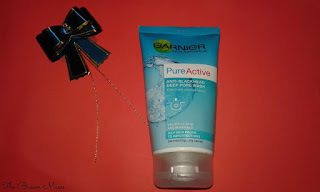 My first review had to be about none other than the very basic skincare product that I have been using recently, that is, Garnier Pure Active Anti-Blackhead Deep Pore Wash. Want to know if it was a hit or fail for me? Read more to find out. 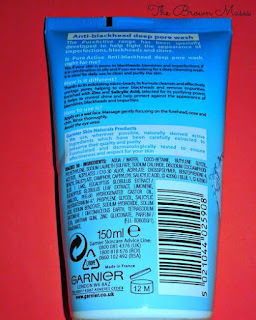 Garnier, a brand of L’Oreal, is a household name in skin and hair care products in Pakistan. • We use, whenever possible, naturally derived active ingredients which have been carefully extracted to preserve their quality and purity. • Formulated and dermatologically tested to ensure effectiveness and respect for your skin. The Pure Active range has been specially designed to help fight the appearance of imperfections, blackheads and shine. Is Pure Active Anti-Blackhead Deep Pore Wash right for me? Yes, if your skin is prone to blackheads, blemishes and imperfections. If it is combination to oily and if you are looking for a deep cleansing wash, it is ideal for daily use to clean and purify the skin. Thanks to its exfoliating micro-beads, its formula cleanses and effectively unclogs pores, helping to diminish blemishes, helping to clear blackheads, and remove impurities. Enriched with Zinc and Salicyclic acid, selected for its purifying power, it helps to control shine and helps protect against the appearance of blemishes, blackheads and impurities. Click this photograph for an enlarged view. My hunt for a face wash that could suit my dry to combination skin is never ending, I presume. I used the Garnier Pure Active Anti-Blackhead Deep Pore Wash *phew* (such a long name) throughout the month of Ramazan and a couple of weeks before. Not to forget to mention that my T-zone gets pretty oily during summers, while the rest of my facial skin remains dry. Moreover, due to the limited intake of water during the month of fasting, my skin was prone to zits, especially the T-zone. So, I was expecting to keep the sebum production and breakouts at bay by using this product regularly as it claims to be for “oily skin prone to imperfections”, containing “salicyclic acid and minerals”, while the goodness of salicyclic acid for acne-prone, combination/oily skin is undeniable. It smells (somewhat) like cucumber – Although the scent is mild but it actually has a refreshing feel to it. This face wash comes in an aqua plastic tube with a fuss free, tight lid as you do not have squeeze hard to pour out the product and there is no chance of spillage either, which makes it quite travel friendly. The subtitle, “anti-blackhead deep pore wash – effectively unclogs pores” is what attracted me to this product. However, to my disappointment, the product did not turn out to be as promising as it seemed. This blue colored face wash has a gel-like consistency, which is considered ideal for combination skin type. It contains blue colored, not-so-gritty, exfoliating micro-beads which exfoliate the skin gently and do not feel abrasive. My skin does feel rejuvenated and revitalized after using this product as it helps me get rid of dead skin cells. Nevertheless, it neither helped me with breakouts and zits, nor in diminishing blackheads which is the only reason why I am not so happy with this product. Moreover, this face wash did not show any remarkable difference in the size and appearance of pores. The good part, however, is that unlike most of face washes suitable for combination or oily skin I’ve ever tried, it does not dry out the dry out my skin. In short, I find it to be more of an average, every day “feel fresh” kind of daily face wash.
Price and Availability: My sister bought me this from UK, but other products from the Garnier Pure Active Range can be bought from local drugstores in Pakistan or online from www.beautyarena.pk and www.saloni.pk for PKR 449. Whereas, those interested in this particular product can purchase it online at www.international.boots.com at a discount offer. Have you tried this product yet? We’d love to know which face wash you have been using lately.